The RPS system is capable of positional accuracy up to ± 30 μm and repeatability of ± 5 μm at its meshing line or circle. Near-zero backlash of less than 3.2 μm is achieved by multiple rollers engaging the rack or gear teeth in opposition at all times. Due to the very high manufacturing precision of the RPS system and the special section joining tool, cumulative error is virtually non existent over any rack run length or segmented gear diameter. The RPS system also provides very low velocity ripple for applications where uniform motion is essential. This allows for high precision linear or rotary systems of any size that can rely on the servo encoder for positioning without the need for separate linear or rotary encoders in many applications. Unlike many other drive technologies, the RPS system’s positional accuracy does not start to degrade progressively after a short time, but maintains its performance over its life until the pinion bearings reach the ends of their lives. In most applications the rack or gear life will far exceed the pinion life, allowing several pinion replacements before needing replacement. The Roller Pinion System is capable of speeds as high as 11 m/sec. Even at these speeds, the extremely low friction design does not create heat or significant wear on components. As machine performance increases, rigidity becomes more important. Unlike ballscrews with their long unsupported lengths, or traditional rack and pinion with their small teeth that flex, fatigue, and break out, the RPS’s robust tooth and pinion design eliminate these issues allowing maximum performance. to and mix with the rack lubrication, making an abrasive paste that can accelerate the wear rate. • Inaccessible Applications where it is very difficult and/or hazardous to access machinery for periodic maintenance. Nexen offers the rack in standard metre and half-metre lengths that can also be cut as required. Standard product lengths make the RPS available for immediate shipment, eliminating the lead times required by other products, and make it easy for OEMs to keep a limited amount of product on hand while covering a wide range of applications. The rotary RPG system is available as solid rings up to 750 mm diameter and segmented rings or arcs beyond this with no limits on the diameter possible. With these modular components, rack runs of any length can be easily created. 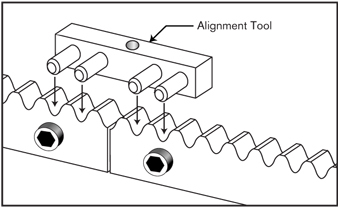 The pinion rollers approach the tooth face in a tangent path and then move smoothly along the face of each tooth. This reduces noise levels often associated with other motion control systems like tooth slap or ball return noise. The RPS rack is available in five models, Premium, Endurance, Standard, Universal, and Stainless Steel Universal. Each offers performance characteristics and price to suit a wide range of applications. Some rack models are available with corrosion resistant surface treatments and/or made from 17-4 stainless steel for difficult applications. Pinions are available in shaft mount with a keyless mechanical compression bushing or ISO 9409 flange mount versions for optimal machine design flexibility. The RPS ISO 9409 flange mount pinions make reducer selection and mounting easier, allows the use of Nexen pinion preloaders, and gives maximum system performance. The best shopping cart software by ShopFactory powers D1315. All-in one eCommerce software and shopping cart.